This beautiful, deep pink cocktail is the result of adding a little cocktail magic from butterfly pea flower to gin, fresh lemon and some of my Homemade Raspberry Liqueur. When they all came together I ended up with this incredibly beautiful fuchsia cocktail. The gin will be blue once you add the Wild Hibiscus B'Lure Butterfly Pea Flower drops, but as it mixes with the acid in the lemon juice it will turn purple. Adding the Raspberry Liqueur will bring it to the deep pink color. The deeper the red color in your homemade raspberry liqueur, the pinker your cocktail will be. Adding the Elderflower liqueur completed the floral theme and I was happily sipping a little bit of an English flower garden at happy hour. DIRECTIONS Chill the glass in the freezer. Mix 1 tablespoon of Honey Ridge Farms Blackberry Creme Honey with 1 tablespoon of hot water for the blackberry honey syrup, strain to remove the seeds then add to the cocktail shaker. 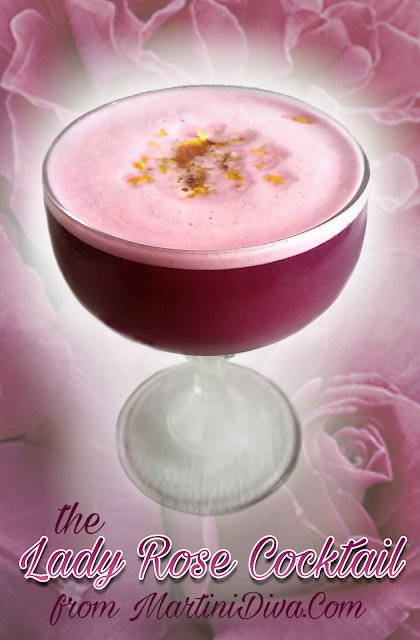 Add several drops of Wild Hibiscus B'Lure Butterfly Pea Flower to two ounces of London gin. Add this to the cocktail shaker with the remaining ingredients and dry shake for a few minutes to emulsify the egg white (or aquafaba) and build the foam. Add ice to the cocktail shaker and shake again to chill. * Strain into the chilled coupe, garnish with a bit of lemon zest and serve. If you happen to have edible flowers on hand they make a really festive garnish addition. * To dry shake my cocktails I usually cheat because I have a bad shoulder so I put the ingredients in a blender then blend on high for 2 or 3 minutes to emulsify, then I transfer this to a cocktail shaker filled with ice and shake to chill.